Whilst the idea of putting plastic in your back yard may seem like a bad idea when you have kids, it is actually much safer that having a real one installed, especially when it comes to small children. After all kids can be very inquisitive and tend to put anything in their mouth – including grass and soil! Luckily a fake lawn removes this ability. Plus, the turfs are nontoxic if they do manage to ingest some. Grass grows on soil and inside that soil are a whole range of insects, bugs, creepy crawlies and germs! When your kids are outside for the first time in a century the last thing you want them to do is get covered head to toe in mud that they will end up carrying all over the house. Artificial grass is soil and mud free which means that children can play till their hearts content, even in the rain! The artificial grass of today shares very little in common with the prototypes of the 1960’s. In fact, not only has the quality improved, the durability has too! Children have a habit of destroying things quickly, but they will have a task on hand to cause a well-made Great Grass turf to get damaged. From football to bikes, paddling pools to lawn chairs and even garden birthday parties, there’s nothing that a turf can’t handle! Keeping the children occupied is always a task, especially when you’ve had to talk them into leaving the comfort of their iPad. Thankfully, artificial grass is on your side meaning there’s no more muddy footprints, ruined soil beds or patchy lawns! 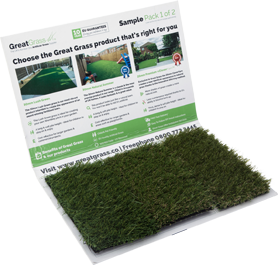 To find out more information, contact the Great Grass team today!